I received an inquiry from a customer one day asking how to limit the voltage to his newly imported Japanese motor for a Nn3 project he was tackling. The rub was that the motor is rated for 6Vdc and he insisted on installing a decoder in the model. Not a big deal deal on DC, determine the point on the powerpack throttle where the output is 6V and never go past that point. With DCC however, the command station supplies maximum voltage to the rail all the time so what to do. Most systems supply between 12 and 16.5Vdcc to the rail. There are a few ways to tackle the problem. The best solution depends on your needs. While this discussion is about solving my customers problem, the concepts also apply to those working in smaller scales, using micro motors for amination projects (e.g. a tooth brush motor to ring a loco bell), and using decoders to provide variable power to other low-voltage devices or lighting. Perhaps the easiest way to reduce the output voltage is to reduce the input voltage. This is a nice solution, especially for Z-scalers and the like, since it affects the entire layout and it is a permanent reduction of power. There is little chance of error once this change is made. Its a great way to protect those delicate little motors. 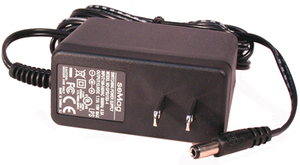 To implement this option, simple replace the stock power supply that came with your command station with one of a lower output voltage. NCE offers the P109 Power Supply for their Power Cab command station just for this purpose. The caveat to this solution is the NMRA Standard S-9.1.2 state the command station must operate at a voltage between +-8 and 22Vdcc. In our case today, we may not be able to achieve the desired rail voltage and maintain reliable command station performance. 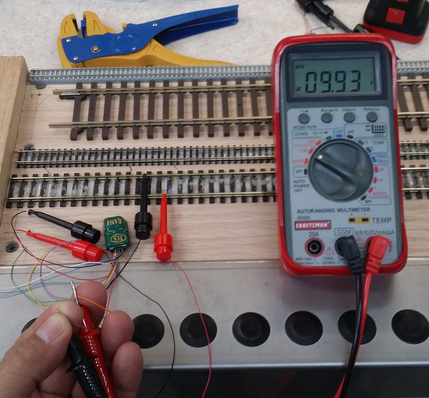 A similar solution that is easy to implement is to limit the output voltage supplied to the rail. This is also easy to implement and very safe since it affects the entire layout. MRC offers the AT880 Universal Voltage Reducer (AC/DC/DCC) that reduces the output voltage by 4 volts. 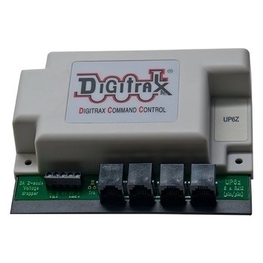 Digitrax offers the UP-6Z LocoNet Universal Panel and 3 Amp Z Scale Voltage Reducer that offers a 4 or 6 volt reduction in output voltage. You could make your own reducer using diodes and bread board if you are so inclined and this would allow you to get much closer to your target voltage. 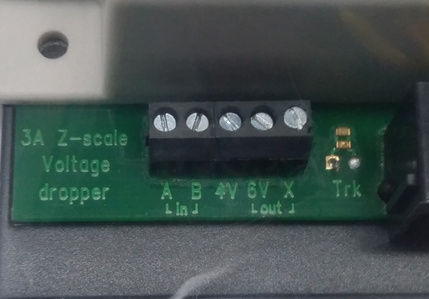 The caveat to these options is they may not achieve the desired level of reduction and you may need to reduce the input voltage also, especially in our case where the target track voltage is 6V. The other problem is they are fixed reductions, all-or-none solutions, so to speak. This means the voltage supplied to ALL engines is now limited to the new maximum output voltage. All engines will now run slower. A third solution to providing a defined maximum amount of voltage to a motor is to limit the output of the decoder using common CV settings. 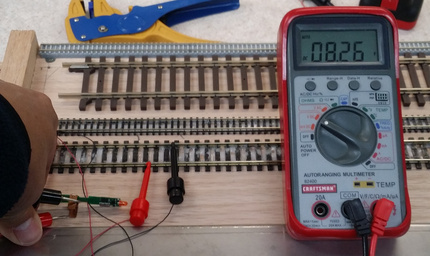 This solution is very flexible and can be applied to any DCC-decoder equipped loco. The maximum voltage can be set to any desired level so each model/motor can be set to its own optimal level. Of course there are caveats to this method also. First, the values are dependent on the voltage at the rail. If you set the CV values based on the output of the command station of your home layout and then take the model to a club or modular layout, the decoder output voltage will most likely be different. Second, if you ever have to perform a decoder reset, you will need to reprogram the decoder since the desired values will be changed. Third, this method is a bit more complicated to implement so it is not for the faint of heart. It's not necessarily hard but it does take effort and a basic understanding of DCC and electricity. It is important to note that this method does not affect the actual voltage applied to the motor. Since decoders use PWM for motor speed control, this method affects the duty cycle at which voltage is applied to the motor. For simple math, assuming the input voltage is 12V and the target motor voltage is 6V, the resulting PWM duty cycle is 50%. This means that 12V is applied to the motor 50% of the time when it is run at the highest speed step. The average voltage applied to the motor is 6V. Huh? Does it matter? Considering that the most likely causes of motor failure are extended high temperature and speed, I don’t think so. So long as the motor is not over heating and the max speed is limited by the average voltage / 50% duty cycle, drive on. You can quibble about the technical details of this approach the last electron but the fact is that it is a practical solution that will afford reasonable protection to the motor when other solutions are not available or practicle. Finally, it is important to note that this method does not affect the actual voltage applied to the motor. Since decoders use Pulse Width Modulation (PWM) for motor speed control, this method affects the duty cycle at which the input voltage is applied to the motor. For simple math, assuming the input voltage is 12V and the target motor voltage is 6V, the resulting PWM duty cycle is 50%. This means that 12V is applied to the motor 50% of the time when it is run at the highest speed step. Considering that the most likely causes of motor failure are extended high temperature and excessive shaft speed, I don’t think so. So long as the motor is not over heating and the maximum speed is limited by the average voltage / duty cycle, I say drive on. Experts might quibble about the technical details of this approach the last electron. It is simply a practical solution that will afford reasonable protection to the motor when other solutions are not available or practical. One of my favorite DCC tools for the workbench is the ESU 51900 LokTester Decoder Test Station. The LokTester provides a full range of common connectors to make hook up of decoder quick and convenient. It also has a motor on-board so measuring and testing the output voltage is very simple. The other recommended tool is multimeter. 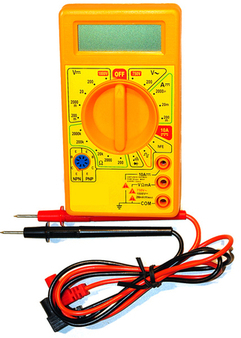 I offer the TCS-distributed 7-function Multimeter but ANY meter will work. Note I say ANY meter will work. 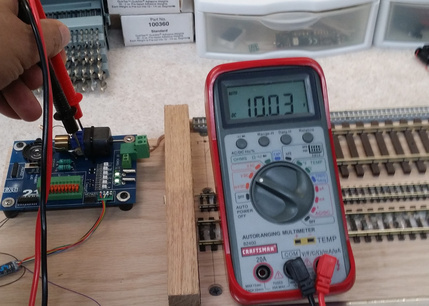 Measuring DCC voltage is not exactly straightforward. You can find a ton of info on the web about this so I wont rehash the subject. There are special meters and tools like the DCC Specialties RRAmpMeter available to accurately measure DCC voltage and they will work for this project also. The key to our topic and the point of my statement is that we can use ANY multimeter. A DCC decdoder rectifies the DCC voltage to common DC to be used by the rest of the circuit and the motor. We are going to measure the output of the decoder, the rectified DCC or pure DC voltage, so any meter will work. The procedure to set the output voltage is pretty simple, just three steps. Of course, there are caveats and you do have to own a multimeter. The first and most important caveat is all of this assumes your decoder is set to the default settings. Every decoder is different so refer to you user manual for specific CV's and values for your decoder. Here is a video demonstration of the process to make it all very clear. The first thing to do is measure the output voltage of the decoder. The easiest way is to connect the decoder to a test stand and connect the test leads to the motor terminals. You can also connect the red and black wires of the decoder directly to the rail and connect the test leads to the orange and grey wires of the decoder. 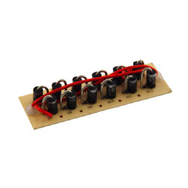 If you are working with a drop-in type board decoder, you can connect test clips to the frame contact pads and connect the test leads to the motor tabs. Turn the throttle to Speed Step (SS) 28 and read the voltage on the meter. This is our maximum rectified track voltage. For this example, I am using CV2, 5, and 6 with a range of 0-255 which is the most common implementation of motor control. As always consult your manual for the details of your decoder. It is important to note that not all manufacturers use CV 5 and 6 and there are a wide variety value ranges implemented by manufacturers. For example, Soundtraxx does not use CV5 and 6 so you have to use a speed table to set the maximum voltage while MRC does not incorporate a speed table and uses a range of 0-32 for CV5 and 6. 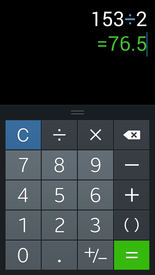 Start by setting CV2 = 0 and adjust upward until the locomotive starts moving. Next we need to set CV5. Assume we measured 10V output at SS28 in the first step. 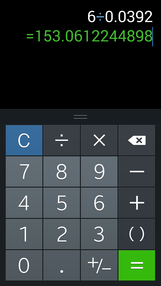 Divide that by the maximum value of CV5, 255. 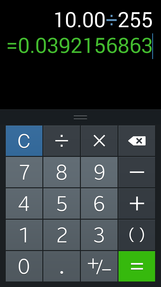 Then divide the desired output voltage by this result to get the value of CV5, 153. Finally we need to set CV6. For a straight-line speed curve, simply set CV6 to half the value of CV5. You can use other types of speed curves to suit your taste but CV6 must be a value between CV2 and CV5. 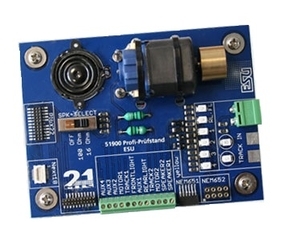 The final step is to simply install the decoder and measure the voltage at the actual motor leads if possible then make any final adjustments to CV5 to dial in the output voltage to exactly 6V and SS28. First, you can do all of this this with a speed table too, you just have to set a lot more CVs. Second, be aware of CV3/4 and CV66/95. These CVs affect the actual output voltage and changes to these will change the motor voltage you just worked so hard to set. Third, be aware that the DC motor circuit of most (all?) decoders is isolated from the DCC motor circuit. This means your new fancy 6V motor is only protected when using DCC as the power source. You can still smoke it when running on DC.